– Fatigue / Insomnia: For me these two things are inter linked. I get tired more as my Humira wears off. But as that happens, I find myself sleeping less and less. It is horrible self fulfilling prophecy. These last few days haven’t been too bad sleep wise – I’ve actually managed a couple nights of decent sleep – but today, the fatigue is back. And I feel so.. drained. I don’t think its anything I can just ‘change’ with a snap of my fingers. Constant work. – Humira: Going into my 5th month of treatment and the needle / injecting issue is getting bigger and bigger. I have no idea why either. I think about it alot – the why – and I can’t get it off my mind. I wish I could just solve it and be back to how I was. – Work: I didn’t know, when I was off sick, how I would ever return to work. But now it is like I’d never left. Amazing how no matter how much things change in my life, challenge me, work will always be the same. – Relationships / Friendships: As always, I’ve been trying to do the right thing, to surround myself with the best people I can find. People who understand and who want to be there for me. Some have left. Some have stayed. Some are blind. Some are just.. there. One.. two, are amazing. I couldn’t do anything without someone special. And I kick myself that I didn’t see it sooner every single day. – Depression: This is a tough one. I didn’t really think I could get that sad about anything. That angry. That defensive. That annoyed. That.. upset. I still do. But going to counselling helps. Or it is going to. I’ve yet to see how the counselling is going to help the extra manifestations of my Crohn’s. Time will tell. 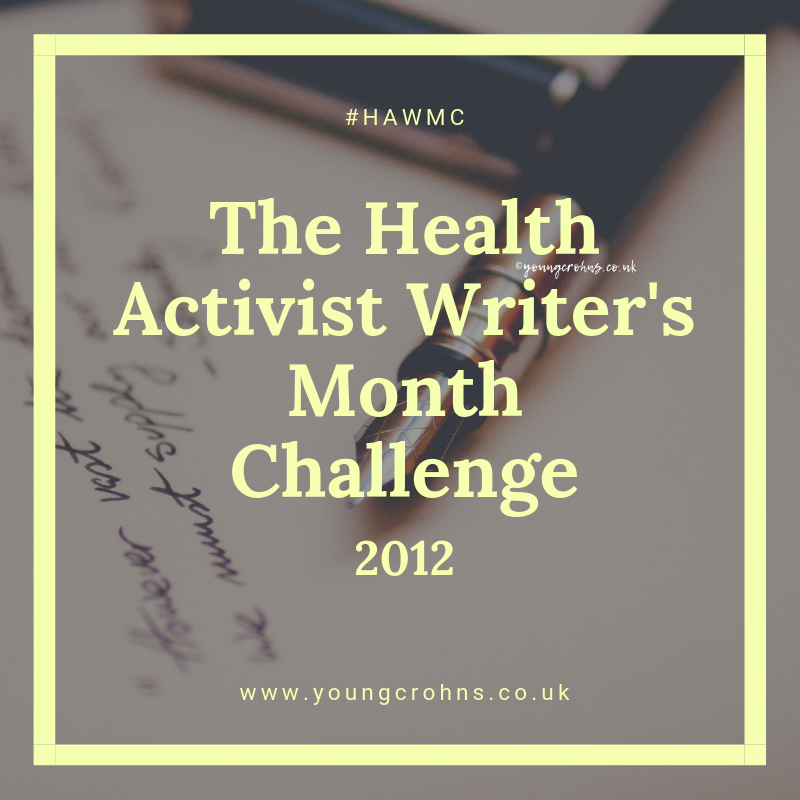 – Being / maintaining ’healthy’: As we all know, being sick is something that is part and parcel of living with Crohn’s. Flare ups! Medication problems! Unable to eat! Tiredness! They all take a toll on our bodies and being ‘healthy’ is a struggle. I was very sick without knowing it for so long, it took me ages to bouncy back. The weight came off and off, the self esteem and confidence plummeted. I didn’t like looking at myself. I didn’t even like thinking about it. I focused on my cranky guts. It took many months; even after I started to feel well again, to like myself. I still struggle with it. And I’ve not even got any physical scars from my time spent at Good Hope. Everything that is ‘wrong’ with me is inside of me; in my guts and in my head. But being ‘healthy’ is something I try to do. Always. Some days its really hard. Others not so bad. But either way, its a step forward, yes? And its better than sitting in my bed at home, depressed and confused, refusing to join the world. – Overcoming fear of needles / hospitals / scans / tests: I was never one to get ill. Never stepped foot in a hospital. Never had anything wrong with me. Until the Crohn’s attacked. Then everything. Blood tests. Being poked and prodded. Cannulas. CT scans. Ultrasounds. MRI scans. X Rays. EKGs. More blood tests. Samples. Antibiotics. Antivirals. Steroids! Pentasa! Azathioprine! 4 admissions, totally 6 weeks. I am fiercely proud of doing all that. Yes, it was necessary. But I still feel that I handled it well. I was always smiling. I was always chatty. I never once argued (well, except for that NG tube fiasco!) and I never once didn’t do what was asked of me. Despite all their efforts on the ward, I got sicker and then got better on more than one occasion. I accepted their plans of action and got on with them. This latest one, its working well so far. – Being open and hoenst about Crohns: I decided a long time ago, pretty much on what would be my final admission, that I wasn’t going to hide my condition. That I would talk about it when it was necessary and when I felt ready to. Thus, I talk alot about things I couldn’t even imagine talking to someone about if it wasn’t for Crohn’s. I have this blog for instance. I have my Twitter family. I have my friends. I have my family. I have my work colleagues. All of who know me. Or at least get to know me in which every way they want to; reading or talking or just asking. I think this is the most important part of everything happening in my life: I talk about my condition, it raises awareness. Raising awareness will lead (hopefully) to better treatment – faster diagnosis, specialist care, correct medications – another self fulfilling prophecy. – Gaining weight! It is a good thing! Back to a normal weight (64.5kg on my last weigh in) and it keeps getting more each week. I still have that little crohnie belly of mine, but that’s never really going to go away whilst I’m in good health. – Knowing true and reliable people: This is a tough one. I spoke before about it being hard to find good friendships and honest relationships. Well, I’d like to think I am better at it than I give myself credit for. I’ve lost a couple friends because of my Crohn’s. But I’ve gained a whole new bunch of people. I thought – honesty, this was my mind set a couple months ago – that my Crohn’s was a sticking point, a flaw in my personality. It took many months and many people’s kind words to tell me otherwise: It is a beautiful quirk. A trait that makes me special. I believe that now. People have left myself because of their own selfish and misguided expectations of me. I can’t be around people who don’t understand or appreciate my condition. You don’t have to know everything about it, but please, don’t push me beyond my limits. I will tell you where to go. So, yes, it’s always a struggle; I don’t know who will be the next person to get on my evil crohnie side, but I know what to do now, much better than I used to.